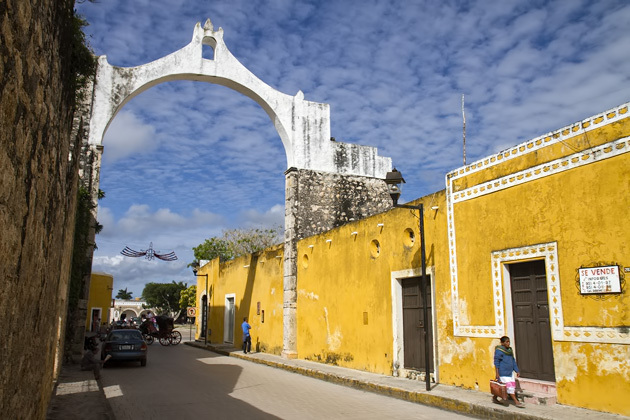 Izamal is a small city and you don’t need a lot of time to familiarize yourself with it, but you will need sturdy legs. Both of its main sights, the ancient Maya pyramid Kinich Kakmó and the somewhat-less-ancient Convent of San Antonio de Padua, involve a lot of stairs and climbing. Kinich Kakmó is just one of the many pyramids which define the horizon of Izamal, but it’s by far the biggest. From the ground, it doesn’t look so intimidating, but this pile of rocks and grass just keeps going up, up, up until you can see well over the jungle which surrounds the city. Dedicated to the Sun God, the pyramid was a place of pilgrimage and worship, and was the nexus of the Maya city. Just a couple blocks away is the Convento de San Antonio de Padua, erected by none other than the despicable Fray Diego de Landa, the Catholic crazy-man who perpetrated the auto-da-fe in Maní and destroyed the bulk of Mayan literature in one fell swoop. In Izamal, he cast his ruinous gaze upon the Maya acropolis, ordering it razed for the placement of a new Jesuit convent. 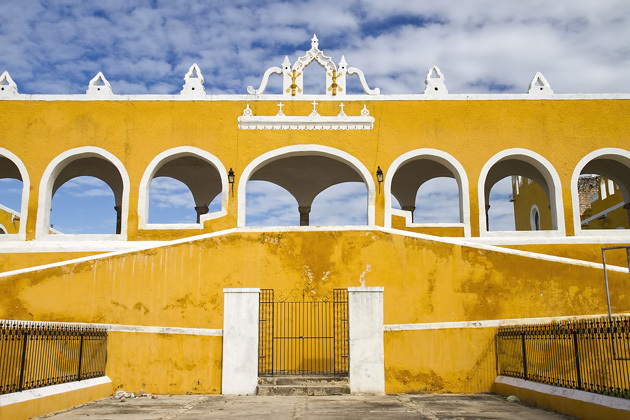 It didn’t take long after the construction of the convent for a miracle to occur in Izamal. (Actually, let’s put that in quotes. A “miracle”.) During a trip to Guatemala, De Landa had picked up a statue of the Virgin, which he erected in the Convento de San Antonio de Padua. The jealous citizens of nearby Valladolid decided that the Virgin would look better in their city, and sent a crew to steal it. But on their way out of Izamal, just as they were passing under the city gate, the statue became ponderously heavy, and could not be lifted even by the combined strength of ten men. It was a miracle! 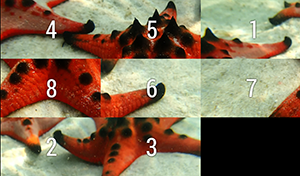 And a pretty trivial one, if you ask me. I mean, this is 1560 or something and there are thousands of impoverished Maya suffering under the boot of Spanish oppression. But God decides to make a statue heavy, so that one city’s gilded riches can’t be brought to another? It’s all about priorities, I suppose, and anyway it was enough to convince Pope John Paul II, who traveled to Izamal in 1993 to officially bless the miraculous Virgin. After climbing the steps that lead to the convent, and hiking to the top of Kinich Kakmó, you’ll probably have had enough walking. Luckily, a fleet of finely outfitted horse wait in the plaza to take visitors on a carriage tour of Izamal, no exercise required. We didn’t have time for this, but it’s surprisingly affordable and perhaps the best way to see the town. Izamal's Pre- and Post-Columbian Wonders Izamal is a small city and you don't need a lot of time to familiarize yourself with it, but you will need sturdy legs. 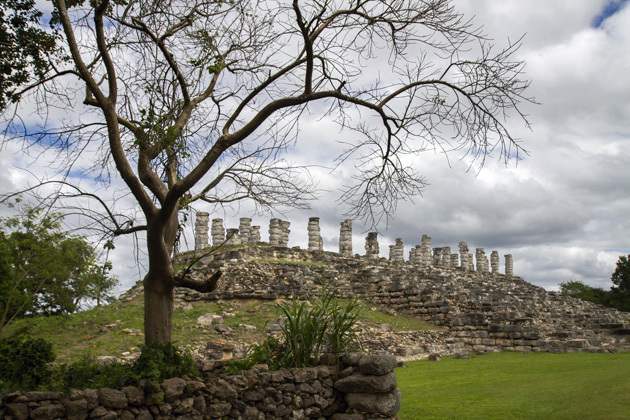 Both of its main sights, the ancient Maya pyramid Kinich Kakmó and the somewhat-less-ancient Convent of San Antonio de Padua, involve a lot of stairs and climbing.